As we hurtle towards digital realities in the age of technology, the internet and social media, do we risk the extinction of our sentient consciousness, mediated by touch, human presence and an appreciation of beauty? Have we all become willful islands, fragments of humanity adrift in the ocean of virtual connections in a globalised world? 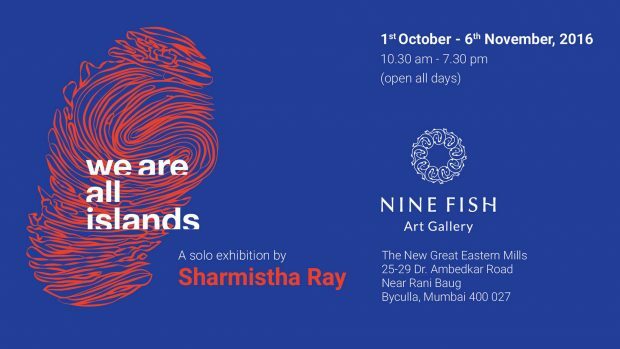 Comprising painting, drawing, sculpture, photography and installations, we are all islands marks a new conceptual direction for Sharmistha Ray, unveiling a bold merger of concepts and practices she has been experimenting with over the last few years. Through multisensory environments, Ray adapts the grammar of identity politics to express the germ of her own history, the voyage of discovery across geographies fueled in part by departures and arrivals, exile and refuge, in search of lost time, unrequited loves and the possibility of transcendence in order to examine the nature of contemporary existence. Exposure to war, migration and coming out in her formative years provides the basis of Ray’s preoccupation with identity politics, cultural hegemonies and the nature of power. Race, ethnicity, religion, history, nationality, diaspora, sexuality and gender intersect at the crossroads in her life, producing multiple ambivalences at odds with the flatlands of globalisation. Drawing on postcolonial theory and queer politics, Ray constructs an autobiography of lived experience, proposing multiple perspectives for the construction of identity. Positing herself as the subaltern subject/object, she devises a map of her (dis)orientations, continually shifting the line of her gaze, manipulating the distance between her body and the objects of her desire to navigate the field of mnemonic disjunctures. Mapping orientation is a way to make sense of time and (in)visibility, evinced by the nuanced overlaying of cultural references in her work. Personal memory becomes a weapon, a form of resistance against cultural erasures enforced by the passage of time and narratives in a state of flux. Alternating notions of presence, touch, sentience and interiority throughout the exhibition, Ray compels us to rethink the scope of humanity by devising our own maps of subjective disorientations.